Two friends, Amber Peck and John Parker from Gainesville, FL leave for a backpacking trip to Hidden Pond in the Juniper Prairie Wilderness in Ocala National Forest. 150 miles away, a 19 year old male wakes up in Largo, FL and decides he wants to know what it's like to kill someone. He boards a Greyhound bus headed to Ocala with a concealed AK-47 in a duffel bag. 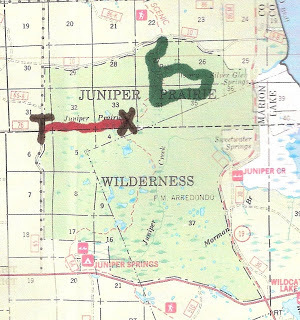 While in Ocala, he purchases camping gear before taking a taxi to the Juniper Prairie Wilderness. Just outside the Juniper Prairie Wilderness area, the young man from Largo hitches a ride back to Ocala. I'm returning to Jacksonville after a business trip to Sarasota and Tampa. My route includes a drive through one of the most beautiful areas of Florida, the Ocala National Forest. It was early in the evening with a couple hours of sunlight left. I frequently include a hike in the forest on my Friday commute home. I planned a hike to Hidden Pond for the first time after reading about its beauty and seclusion. I often hike alone in desolate wilderness areas and people usually ask if I'm afraid of bears, snakes, alligators, etc. I always respond that I'm more afraid of the people I might come across in these secluded areas. Usually, you can tell the serious outdoors person by their clothes, gear, cameras, etc. Outdoorsy people do not scare me and are almost always friendly and ready to share friendship and stories. Every once in a while you came across a person that looks completely out of place. I'd rather stumble upon a mama bear with cubs than a person who is far off the beaten track for reasons other than getting back to nature. When I arrived at the trailhead for Hidden Pond, a red truck was alone in the parking area. I had no way of knowing at the time, but the truck was left by the backpacking friends from Gainesville. The Ocala National Forest has a "wild west" reputation. You hear and read about squatters living off the land, secret meth labs, the "Rainbow Group" and people who just want to walk away from society, ending up in the National Forest because law enforcement agents are far and few between. Usually these people are deep in the forest, but if you stumble upon them, they usually threaten you to scare you out of "their" area. I've heard stories that they will take your drivers license so they know who you are and where you live to scare you into silence. I can't explain it, but I had a bad feeling about this lonely truck. I went with my instincts and continued beyond the Hidden Pond trailhead. I drove a couple of miles and parked at the Pats Island Trailhead. From this trailhead you can still hike south to Hidden Pond or you can split off to the east and hike the Yearling Trail. I decided to explore the Yearling Trail. The decision was made easier by the fact that I knew there was a family frontier cemetery along the Yearling trail that I wanted to check out. I hiked four uneventful miles without seeing another person. After returning to the trailhead, I headed for home just as the sun disappeared. Because Peck and Parker left an itinerary, family members knew where to look when they were overdue. After finding the truck, Peck's father and brother-in-law started down the trail towards Hidden Pond. Around 8:50am they came across the bodies of Peck and Parker. Both had been murdered at the edge of Hidden Pond. I found out about the murders from a friend who knows I like to hike in the Ocala National Forest. After a quick search online, I realize I had hiked within a mile of the bodies the day before they were discovered. I also saw a picture online of the red truck exactly the way I remembered it as I passed the parking area. Police were looking for clues and witnesses. I was not sure what to do. Yes, I was in the area, saw the truck, but I did not see a single person that afternoon in the forest. Before I could make a decision on contacting the police or not, I read that an arrest was made in the double murder. The driver who picked up the hitchhiker on the 4th came forward Saturday evening after learning about the murders. Within two days, the police had followed the murderer's trail right back to the mobile home he shared with an uncle. The victim's families did not want to hear the gruesome details of the murders during a trial. They also were not sure if the victims would want their killer executed. The families agreed to a deal that would give the murderer two life sentences after pleading guilty to two counts of murder. To this day, I have never hiked to Hidden Pond. I often think about these murders while hiking, making sure I look around and stay familiar with my surroundings...not that I can do much to protect myself or the girls against an AK-47 in the hands of a cold blooded killer from 30 yards away. I'm still haunted at how close I came to finding the bodies. I wonder if I would have continued my hobby and if not, how different our lives would be today, more than 11 years later. I also try not to think about how a change of just a couple of days and it could have been me hiking along Hidden Pond when the killer was looking for a victim to murder for no reason. Below is a map showing how close I hiked to the crime scene. The killer probably hiked out along the Yearling Trail, judging by the location of where he was picked up while hitchhiking. T The trailhead where the red truck was parked. ---- Trail hiked by Peck and Parker. X Spot were the bodies were found. ---- The four mile trail I hiked.